Are you wondering what to pack in your lunch boxes for next week? 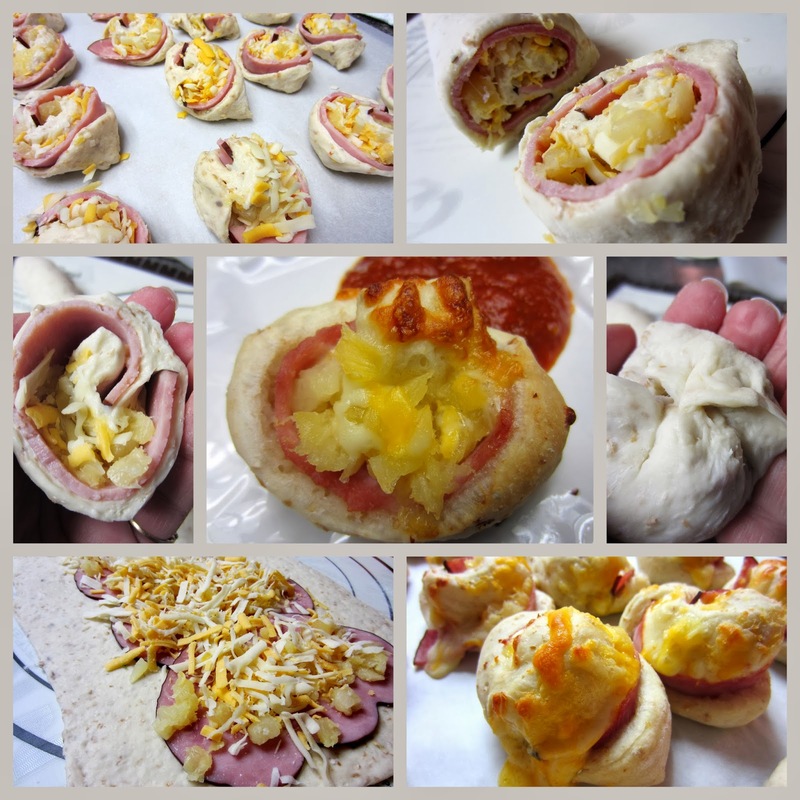 Ham and Pineapple and Cheese Swirls can be made and frozen and packed into lunches. By the time lunchtime comes, the buns are thawed and ready to eat. I've used a small recipe of Anneliese's easy french bread dough but you can use any refrigerated dough in a tube if you are in a pinch. Put sugar, oil, salt and hot water in a large mixing bowl. Let rise until double, about 1/2 hour. Roll dough into a long rectangle about 8 inches wide. Layer the ham, pineapple and cheese over the dough, leaving an inch around each edge. Roll up starting with long edge and cut into even 1 1/2 inch pieces. Pinch underside of dough together to keep cheese from melting out. The top of the bun will open up more and that is fine. Place on a parchment paper lined pan and cover for 45 minutes. Bake in a preheated 400 F oven for 15 - 20 minutes or until lightly browned. Yum - what a fantastic idea to freeze these and take to work for your lunches or to snack on while watching the Olympics! !